At a recent Traverse City high school volleyball match, students and fans began chanting “TC Rick, TC Rick, TC Rick.” But the focus of their cheers was not a student nor a coach – it was a retired photographer. 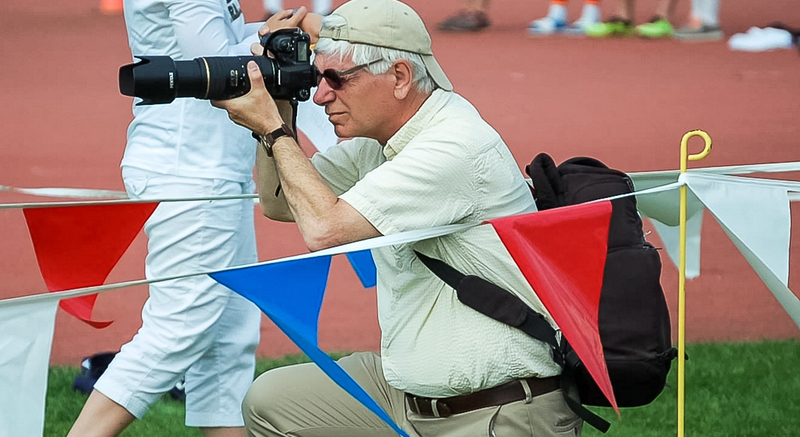 Rick Sack, who has been taking photos at Traverse City Central, Traverse City West, and St. Francis high school sporting events for more than a decade, has become a fan favorite. Sack is a fixture at all sorts of TC sporting events; he posts the photos immediately on his website, TCRicksports.com, and makes them available for parents and students to purchase. To cover so many events, Sack estimates he’s out somewhere shooting five nights on a typical week. On a recent weekend, he spent nine hours shooting three games on Friday and nine more shooting three more events on Saturday. “For every hour spent shooting, there are two or three hours downloading, editing, processing, filling orders, and more,” he estimates. When Sack and his wife Cindy moved to their northern Michigan retirement home in 2005, he was looking for a hobby to keep him occupied. “I never really picked up a camera until I retired,” Sack recalls. Among his favorites are the bigger statewide competitions. "It's always special when I get to cover a state championship event," says Sack. "In 2012 and 2015, I managed to get media credentials from the school to cover TC St. Francis at the final four volleyball championships in Battle Creek. The 2012 team finished as runners-up after a big comeback win in the semifinals. I attended the team banquet after the season and presented parents with a CD of pictures as a gift." Earlier this year he covered the Division 1 State Track Championships in in East Kentwood where both TC West and TC Central had strong entries. Over the years, Sack has amassed an inventory of an 72,000 sports images.